I met one of the editors of this anthology on Twitter recently and she sent me a link to check out her book list. All looked interesting but it was Qatari Voices that really caught my eye. This is the sort of non-fiction to which I’m drawn — exploring a new culture and taking myself out of my world. What I did not expect was to find as many commonalities as I did with this grouping of essays. All are written with varied skill, as one would expect from students, but all are written with heart. The introduction shares the idea of free writing with us as allowing the writer’s thoughts to “spill across the page” (location 96). It is exactly with this easy and conversational style that most of the essays are presented. Many of the essayists share memories of their grandmothers. Women they cherished who worked hard, married young and weren’t afforded the advantages that their grandchildren have. Essayist Maryam Ahmad Al Subaiey shares with us a memory of a grandmother who left the nomadic lifestyle to settle and is constantly moving and “building and demolishing” (location 196). The image of the grandmother and the affection of the writer for her is vivid. She tells us of the grandmother being called in while playing with her fellow children in the garden as a nine-year-old child to be informed that she was to be married. The retelling is with heart but also the realization that this is how things were. Another essay that resonated with me was by Mohammed Jabor Al Kubaisi. He tells us of his family leaving the tribal life for jobs in the city. “(in the new town) … there was no sea for fishing, no birds singing and no huge boats for diving to look for pearls…the thing that made the new situation easy to accept was that we were also together.” (Location 248). The beauty of the language with which this essay was written moved me as did the relation to my own story. The essayist and I may come from completely different cultures, but I grew up in a town of misplaced southerners who had come north looking for the jobs that were so unavailable in their hometowns. 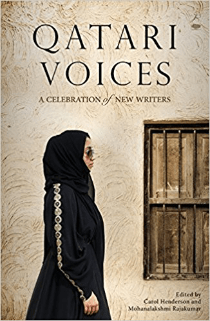 These are just a few tastes of what to expect in this delightful anthology of essays in Qatar Narratives. I really enjoyed this look into another culture and seeing the reflection of my own. I highly recommend this anthology not only for my fans but for your children. In a few years, when my daughter is 12 or 13, I’m going to download this book to my daughter’s Kindle. This visit with the people of Qatar is an unexpected and enlightening joy. Mohanalakshmi Rajakumar has been living in Qatari since 2009. For more information about her, visit her website. You can connect with her on Goodreads, Facebook, Instagram and Twitter @moha_doha.